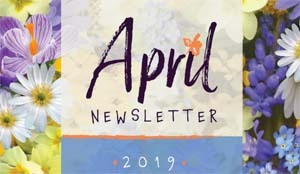 "The purpose of the Guild shall be to assist children in need and/or mother-child care programs throughout the world, and to serve as a mutual bond and center of interest for women connected with the United Nations Organizations in Vienna." UNWG Vienna will celebrate International Women on Friday 8 March 2019. We will meet at Vienna International Center, Hall C3 (7th floor), 09.30-12.00. Supportive staff members of the VIC will be recognized. There will be stories of great women, music of our time and images of solidarityaroundthe world. "Malaysia Truly Asia" captures and defines the essence of the country's unique diversity with a potpourri of a culture consisting of Asia's three major groups: Malay, Chinese, Indian, plus various other ethnic groups such as the Iban, Bidayuh, Kadazan and more. 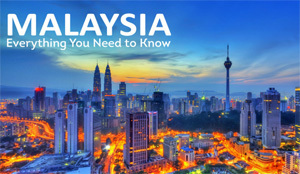 Being a multicultural country, Malaysia, which is noted as a 'Food Paradise', offers a wide variety of cuisine. This coffee morning promises UNWG members will be treated to an exciting presentation of food and cultural. There will also be a presentation on Malaysia, display of traditional costumes, beading demonstrations and a traditional dance performance called “Joget Pahang”. 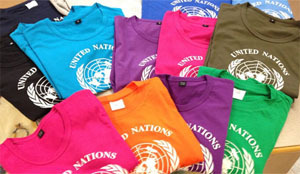 We have changed the program for this meeting to a presentation of the UNWG's Charity Shop. The UNWG Charity Shop manager Alara Orbay will explain the Charity Shop's activities, the joy of discovering a special bargain and opportunity to meet new friends. It also an interesting history. For many years the program was called "White Elephant". Why? It's so valuable, so rare but also very big for most of our homes. The illustration above is an image created by Ulli Modro, a talented IAEA retiree who has illustrated several children's books. 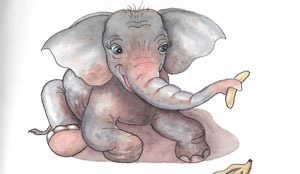 This one is from "Biju the Baby Elephant", written by Susan Cohen, another IAEA retiree. It has been published in Chinese, Dutch, French, German, Italian and Portuguese translation. User Name & Password required. Please contact the >>UNWG office for detail. €224,903 for 28 projects in 27 countries has been approved by the UNWG general members for funding in 2018. 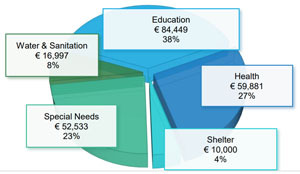 This amount was raised by members of the UNWG in 2017. For a list of the projects approved, click >> here. Notifications have been sent to all approved applicants. Due to the large number of applicants (900+), only approved applications have been notified. 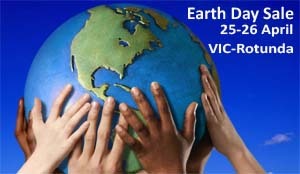 In an effort to be sustainable the Kiosk will be showcasing green products in this sale Exhibit in honor of Earth day. New products will be presented for the first time. They are made from recyclable materials from pencils -to-plant, cups to go, bags.We are proud to present our own UNWG LOGO sustainable Badge holder, made out of worked recycled plastic, the first to be made of this material ! Sale of souvenirs from Austria and around the world. We also repair jewellery at reasonable price. Call us:2600-21313 at opening hours. All proceeds go to UNWG children's charities. 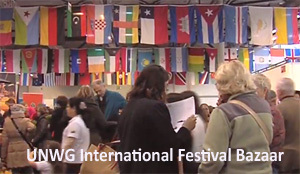 "Ethiopean Documentary" presents a video showing the UNWG Bazaar through many years. Please click >>heree for the link. 2018 Charity Review Committee: Sandya Perera Chairwoman (Sri Lanka), Karissa Laughter, Alternate Chairwoman (USA), Shreela Shrestha (Nepal), Gill Spina (United Kingdom), Cathy Kieffer (Canada), Najwa Chedarri-El Gharbi (Morocco), Patricia Esperon (Argentina), Nataliia Kuzmanenko (Ukraine), Philomena Ugbor (Nigeria), Faten Qubain (Jordan), Maya Subki (Indonesia), Diana Oyugi (Kenya), Belinda Leslie (Australia), Deborah Danielson (USA), Kayo Nakano (Japan), Xin Ke (China), Stephanie Jepsen (Australia), Nayra Younes (Egypt), Tezer de Groot (Turkey), Makiko Nagai-Xerri (Japan), Marina Kalinkova (Russia), Rosario Jara de Vela (Ecuador), Vera Keselicova (Czech Republic), Susan Suvedi (Nepal), Aloma Macho (Austria), Gulnar Hantes (Lebanon), Rahel Fikru Wedajo (Ethiopia).